Congratulations to The Choral Club of Hartford. The Choral Club of Hartford, 104 years old and still “LIVE.” I love that gospel swing! Very commendable. 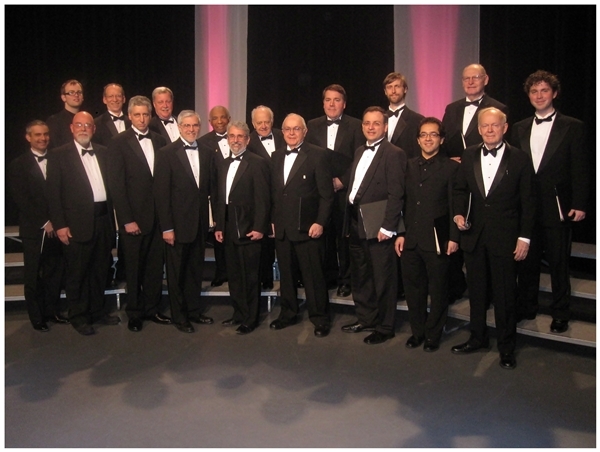 An all male choral society is pretty rare these days. I’d give you a thumbs up but I don’t belong to facebook. Thumbs up for The Choral Club of Hartford. I like this one. The piece is a winner! Good luck. Very nice work. I think the sound is a lot better than the video work, which is has too much zooming in and out and all around. I vote for this performance. Beautiful — I enjoyed it so much that I put it in my Favorites. Now I can go to it and listen to them sing whenever I want to. Good luck. Enjoyed it! You’ve got my vote! That was AMAZING!!! Congratulatiosn to the Choral Club of Hartford. Saw the program last night. Kudos to all the groups. I vote for the Choral Club of Hartford. Thumbs up for The Choral Club! My vote goes to all the guys in The Choral Club of Hartford. I sang with them after I got back from Iraq (two tours with the Marines) and before I headed off to graduate school. Good work and keep that 104 year tradition going strong. What a good idea for a TV show. I vote for the Choral Club of Hartford. Channel surfing pays off. Liked the show. My vote goes to The Choral Club of Hartford. Thank you. Nice show. I wish I could get a copy of it. The Choral Club of Hartford gets my vote. The Choral Club of Hartford singing up there at Springfield Public Broadcasting. Bravo. You get my vote. Can’t wait for the Spring concert in May! You’d think CT Public TV could come up with an idea this good, but Springfield beat them to it. I’m glad my cable system carries both channels. I’ll vote for The Choral Club of Hartford. Very nice. Glad to hear you are all still singing. No question about it! Go CCoH! CCOH Rocks! See you in the finals. My wife and I like your style. We vote for The Choral Club of Hartford. Excellent. You have my vote. Best wishes in the next round. I passed this link onto my friends to come listen. Very nice. You get my vote. “River In Judea” is my favorite CCoH song by far- great job as usual! You’ve got my vote! Another fine performance by the Choral Club of Hartford! Add my vote! I love this group! It is amazing that a singing group has been around this long and still sounds great. They have my vote for sure! Nice job. You can tell that they sing with their hearts and souls. Beautiful sound. I vote for the Choral Club of Hartford! You all look so spiffy and sound great too! nice job…you get my vote…way to go. Keep singing your hearts out. Very nice performance. My compliments to the Club and my vote for the Club. A real toe-tapper. My vote for this group. Like your sound and power. I vote for the choral club! I’ve been to many concerts. Good job guys. Another vote for the Choral Club of Hartford. I agree with Henry. Unique harmony; a vote for The Choral Club of Hartford. Bravo for The Choral Club! Can’t wait for the next concert. Count my vote for this group. Yes!! This is pretty good. My vote for the choral club. I listened to all the adult groups. I vote for the Choral Club of Hartford to go on to the next round. Yes. Way to go! Great performance. You definitely get my vote. Three cheers and a vote for the Choral Club. Wonderful music. A vote for The Choral Club of Hartford. Very good and absolutely immense. Go Choral Club.